It’s the case of the hack turned flack. Today, North Dakota’s leading political reporter announced that, after months of covering the governor race, he’s been hired as a spokesman for the winner, Doug Burgum. If Nowatzki thinks Burgum is Jesus 2.0, then how can we trust that he covered the race without fear or favor? The latest story Nowatzki wrote about Burgum was published just four days ago in the Fargo Forum. So when, exactly, did Nowatzki decide to work for the governor-elect? Was it within the past four days? Was this a possibility he’d ever discussed with Burgum in the past? Nowatzki covered state government in Bismarck for Forum Communications since 2013, and his stories are published in all the major newspapers in the state. This is a major blow to the credibility of the Fargo Forum and every other newspaper that published Nowatzki’s 56 stories about Burgum this year. From what we can tell, Nowatzki’s stories look fairly down-the-middle. He doesn’t fawn over Burgum in his pieces — editors wouldn’t allow that. But it’s still problematic to hear Nowatzki express reverence for Dear Doug. In October, we emailed Nowatzki information about Burgum’s health. We had proof that he had major surgery in Los Angeles last year, and we thought it was newsworthy. We even solicited comment from a state senator, who told us it would be bad for Burgum to reveal details of his surgery, because health problems hurt Heidi Heitkamp politically when she ran for governor in 2000. Nowatzki replied to us, “Sounds interesting” and requested more information, which we sent him. Then we didn’t hear back. Maybe Nowatzki genuinely didn’t think it was newsworthy. Or maybe he didn’t want to upset his buddy Doug. 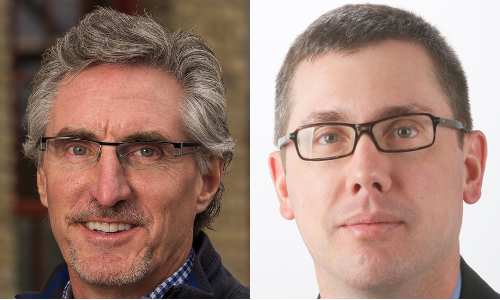 Be the first to comment on "Political Reporter Goes From Covering Burgum to Working For Him"